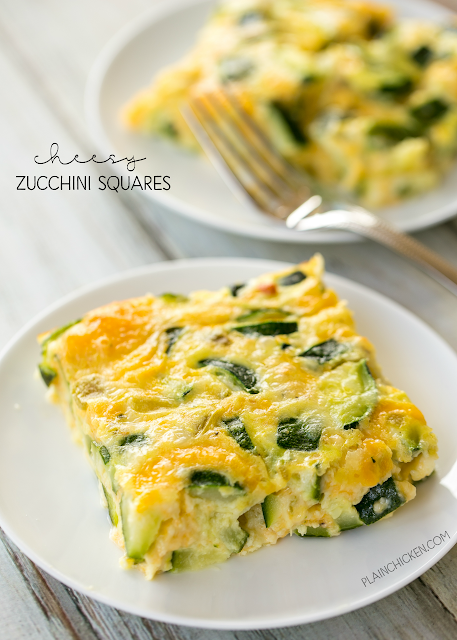 Cheesy Zucchini Squares - DELICIOUS side dish or breakfast casserole! Perfect way to use up all that yummy summer squash! Zucchini, flour, baking powder, milk, eggs, green chiles and Monterey Jack cheese. We served this as a side dish with our grilled meats and had the leftovers for breakfast! SO YUMMY! Everyone raves about this simple side dish recipe! Zucchini has become one of our favorite spring vegetables. I am always looking for different ways to prepare it. I came across a recipe for Cheesy Zucchini Squares and decided to give it a try. We both took one bite and were in foodie heaven. SO good! We served this as side dish with some grilled chicken, but it would also be great for breakfast! 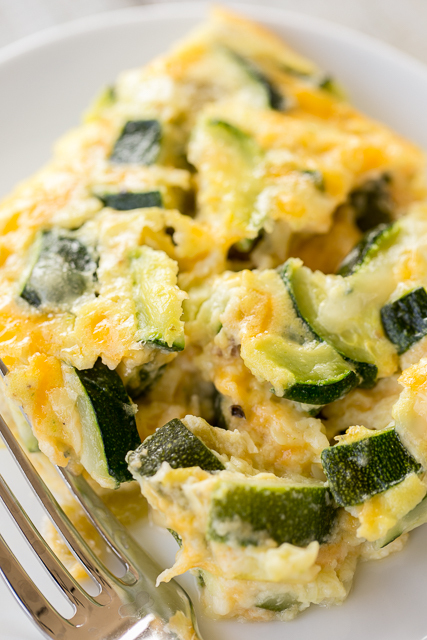 The zucchini and cheese are baked in an egg mixture, so it is similar to a veggie breakfast casserole. This recipe makes a ton! It would be great for a spring/summer potluck.The casserole has a little kick from some green chilies. If you are worried about the heat, you can certainly leave out the green chiles. These Cheesy Zucchini Squares got 5 stars in our house. We will definitely be making this dish again and again. Preheat oven to 325ºF. Lightly spray a 9x13-inch pan with cooking spray. Set aside. In a large saucepan, cook zucchini in boiling water for 4 minutes; drain and cool for 10 minutes. In a large bowl, combine flour, baking powder and salt. Whisk in milk until smooth. Whisk in eggs, beating well. Stir in green chiles, zucchini and cheese. Pour mixture into prepared pan. Bake uncovered for 40 to 50 minutes, until toothpick comes out clean. How many times to one have to subscribe? I obviously am. Have to start from the beginning so many times and the intrusion of so many ads. You are not the only site either subscribe or you can't view the recipe. Most of the sites I have not bothered and am deleting. You don't have to subscribe. That box may pop up but you can click out of it. You only subscribe if you want an email telling you there's a new recipe on the blog. To see the recipe all you have to do is scroll down to where it says in big green letters - "Continue Reading for Recipes" - and click on that. You will get the recipe. Nothing else you have to do. Scroll down and click. It's really very easy. Same thing for other sites as well. Hi there! This looks super yummy and I am getting ready to make this! Just wondering about how long it keeps in the fridge? Or if it can be cut up and frozen, then reheated for breakfasts? Thanks for the recipe!